"The Fetus Has the Ability to Cry"
29 weeks That statement stopped me dead in my tracks when I was reading about 29th week development. I've often wondered if babies cry in utero. I hate to think of my little on crying inside, all alone... Why would s/he cry? At the same time, what do they think about now that they have the cognitive ability to think? Is it like in Look Who's Talking -- is the little one blissing out on their own hand movements? I'm pushing the crying statement from my mind. I believe I have a happy baby. S/he is certainly very active these days. Yesterday my belly was in constant motion, with lots of high kicks and jabs. I half wondered if the baby hand turned over. And maybe it had, but today the kicks are low again. I just read that most of the weight gain in pregnancy occurs between weeks 20 and 30. So far for me, that is right on. Since my last prenatal right before Valentine's Day, only 2 weeks ago (!) I've gained 4 lbs. Overall, I've gained 20 lbs so far. I'm not too concerned about it. I mean, I want to gain enough for the baby, but not so much that it affects me emotionally after the birth. It is hard to get too caught up in it, though, right now. Mostly I just feel so in love with the swelling of my belly. I love all these changes since they mean the baby is growing, too. That said, I do feel heavier these days. On Sunday I went swimming with my friend Erin. That was fantastic. I did a few laps while she did the same (though her laps were much more professional looking and impressive compared to my slow breast stroke! ), and then we ended up kind of running up and down the lane with the aid of kick boards while we chatted and caught up. It felt so good to be weightless and yet able to really stretch out my calf muscles. Running! 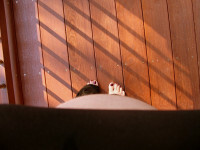 I've always wanted to be a runner, but I'm just not, and certainly not while I'm pregnant! The night before I was awakened by 3 different leg cramps (ouch!) so I really needed that swimming stretch. So now my pregnancy exercise includes swimming, yoga, walking, treadmill, elliptical, stationary biking and regular biking, and strength training. Other happenings... let's see. Last night I went to my first ever La Leche League meeting to see what that was all about. I went with my friends Christina and Vivienne (age 3 weeks). There was one other mama there with her adorable 17-month-old, Rosa. The topic of the meeting was getting started breastfeeding, so it was very interesting for me to hear. The leaders shared stories from their own experiences and then invited us to share or ask questions. I found the whole thing very nice and think it was great to go while I'm still pregnant because I haven't been around too many nursing mothers. The meeting made me feel that much more prepared. I also borrowed a book from the group called Nursing Mother, Working Mother. I know working and breastfeeding will be a challenge, but I also know that breastfeeding will help to keep the little one and I close even when I have to be gone during the day. Anyone have any stories to share of how they've managed to combine breastfeeding & working? The other night, Joe was making me laugh so hard. I was lying in bed, and he had his hand on my belly. And I was seriously laughing -- like when no sound comes out and you think you might actually suffocate from laughing. Well, as I laughed and contracted my abdominals, Joe could feel the little one's head poking out through my belly wall. I felt it too. It was the most wonderful sensation to feel this round object in my palm and to know that it was a head. I fell that much more in love with this little person at that! Later that night, Joe said he loved the baby. It isn't surprising, but still it made me wonder. I feel totally connected and bonded with this life within me, but Joe doesn't have that feeling of something growing inside. And yet, he feels bonded too. I think hearing the heart and feeling the kicks helps. And when Joe reads to the baby, the baby gets very still and listens. It is amazing. Can't wait to meet you, little bug! 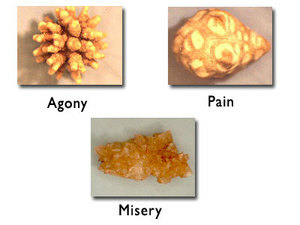 The kidney stone I passed in the hospital was analyzed and the results are back: It was composed primarily of oxalic acid crystals, coupled with calcium. So, what does this mean? A low oxalic acid diet for me, at least until the baby comes. As I've mentioned to some of you, I'm still experiencing light pain from time to time in my kidney. The doctor said this is because I'm still passing crystals. They are too small for me to see in my urine, but large enough to irritate the kidney and all the piping (plus it probably isn't helping that from time to time the baby squishes the pipes!). So I'm to keep on guzzling tons of water so I can keep flushing the crystals out. There is no danger to the baby or any reason that I can't have a homebirth so long as I don't develop a kidney infection -- hence the water guzzling to get those crystals out! So, what is a "low oxalic acid diet"? 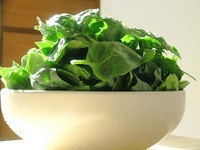 Many leafy greens are high in oxalic acid, unfortunately. So I have to avoid spinach, amaranth, lambsquarters, parsley, chives, purslane, rhubarb stems, beet greens, and collards. However, I'm delighted to learn that kale, chard and broccoli are not on this list! The other day in my yoga class I heard a phrase I'd never heard before: "princess pregnancy." Meaning, the first pregnancy, when there are no other children to be cared for, too. I have to say, I truly am having a princess pregnancy, and I'm not at all shy to say that I'm loving it! I love being able to fully focus on the changes happening to me, and to explore the best ways to embrace this time. I think it would be really different with a toddler to chase after, too. I imagine that is a whole new level of fatigue that I've yet to experience (though maybe I came close with the being pregnant, working 40 hours a week & moving!). Part of my princess pregnancy, too, is getting so much wonderful attention from my family -- from Joe waiting on me, to Pam cooking me dinner, to all the others who have been buying me gifts & asking me questions -- don't mind if my answers go on and on about me & the growing little one. The Final Frontier: Welcome to the 3rd Trimester! 27 weeks pregnant; just 13 weeks till the estimated due date! I'm writing this tonight from my bed. Over the top of the laptop, my eyes keep drifting over to a just-arrived bassinet now parked in front of the dresser. My friend/massage therapist/acupuncturist, Kate, just dropped it off tonight since her little guy is now 6-months old and, like, way over the whole bassinet scene, dude. It is a trip having the bassinet here. This is our first big baby thing. Prior to this, if you were a stranger visiting our house, you'd have no clue a baby was on the way (assuming me and my belly weren't here, too). Now, suddenly there is unmistakable baby paraphernalia! Kalli, the cat, is very suspicious -- and rightly so! Anyway. How am I? No more kidney stones. Yet. I'm still having pain off and on but nothing at all like last Thursday. I have a follow up doctor's appointment tomorrow to see if I should be concerned any longer. Otherwise, I'm doing great. Still feeling very good (well, aside from the major case of heartburn I'm experiencing tonight; as Juno said, this heartburn is radiating even my knee caps!). My belly is getting bigger and bigger, and I'm loving it! I love watching the changes in my body. And the baby's kicks and jabs are stronger every day too. Joe and I are really enjoying experiencing this movement together. Sometimes Joe is amazed at the strength this little one exhibits! The baby weighs approx. 2 lbs now! Scientists believe that around now the baby begins thinking! I suppose maybe every pregnant woman has a least one scary ordeal during their pregnancies. Or, at least one pregnancy-related story to tell. I now have mine. On Thursday, I had to leave work via ambulance due to such intense pain in my back that I was vomiting and unable to walk or really see straight! At first I had no idea what it was and the paramedics took me straight to Labor & Delivery at Dominican Hospital, which was extremely scary and I remember crying and apologizing to Joe. As it turns out, though, I was having kidney stones! Tremendous relief to realize that this was something manageable and not at all related to the baby (who was kicking and moving around a ton during this whole thing!). We were in the hospital for approximately 6 hours on Thursday (Joe, me & my dear friend Michelle). During that time, I was hooked up to an IV and the fetal heart monitor (I seriously don't know how women labor hooked up to these things because I could not hardly manage my back pain being so tethered!). They offered me morphine for the pain, but as bad as it was, I never felt that I really needed it (later, though, I did take some vicodine before bed). I also had an ultrasound to look at my kidneys and bladder. I passed one stone in the hospital and since then I haven't seen any. Thursday night at home the pain was still there, but much more manageable than in the hospital. At home I walked around, used a heating pad and lay over my yoga ball (which was amazingly comforting). Yesterday, Friday, I woke pain-free. I had a few aches in my kidney, but no pain until after 9pm when the aches and pains really intensified. Not so bad that I couldn't sleep though. 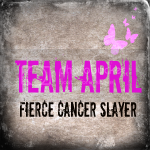 So today, Saturday, I'm just waiting to see what happens and if I pass more stones or not. I'm just filled with such intense relief that the baby is fine, and that I'm fine. In a way, Thursday was probably really great practice for Joe & I -- better than any childbirth education class! He was fantastic. I know he'll be a wonderfully calm, attentive presence during labor. 6 Months Pregnant -- in Photos! I just realized that the baby is due in just 100 days! Only 100 short days will our lives change forever... It is truly amazing to think about. I have no idea what to expect! That's 100 days to get all those boxes out of the middle bedroom (!) and start decorating it with some bright contrasting colors that will be pleasing to a little one's eyes... I better get on this while I'm still riding the energy of the second trimester! Which is 6 months pregnant (I feel like my bump is still a wee one...). 2 weeks shy of the third, and final, trimester. More complete update & photos to come this week. The post a couple of days ago about products I've discovered and loved while being pregnant got me thinking about other life-savers I'm utilizing & will now shamelessly promote! I absolutely *love* the prenatal yoga class taught by Treea at the Pacific Cultural Center on Saturdays. I wish I could do this class every single day! The emphasis is on poses specifically useful for pregnancy and/or labor & delivery, so they make me feel so good by the time I leave. But the other added benefit is being in a room with so many pregnant women. I love hearing where everyone is with their pregnancies and checking out their beautiful bellies. 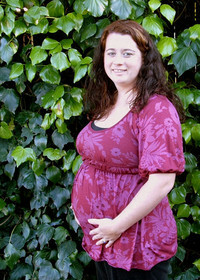 We have women all the way from 13-weeks pregnant to 40-weeks pregnant! At the end of class we circle around and sing to the 39, 40-week pregnant mamas in case they deliver before the next yoga class. I'm so glad to have found this class! Once a week I meet with a personal trainer who has become a friend to work out in the park. I was working out with Machelle prior to getting pregnant, so we've been able to continue these work outs, though they have had to be modified as my energy changes. It is really fun working out in the park -- Machelle utilizes everything around us from the children's play equipment to the stairs and park benches (hence the invisible gym). It is just one hour each week, but afterward I feel so loose and happy. The workout does wonders for both my body and my mind! And I know Machelle will be great for helping me work off the "baby fat" and strengthening my abdominals after I deliver! I've been seeing Kate for a few years now and she's amazing. I send all my friends her way either for acupuncture, massage or both. Sometimes Kate helps me get over a cold, other times we focus on emotional things that are wearing me out. Whatever it is, I always leave Kate's office feeling calm, relaxed and rejuvenated. Kate's also a new mama, so she remembers very clearly all the little things I'm dealing with these days -- particularly those days when I'm just up to my neck in hormones and doing all I can to stay afloat! And the best part is, acupuncture really helps! In the meantime, what things did you discover in your pregnancies that kept you sane & feeling beautiful? The biggest news to report is that Joe can feel the baby's kicks now! He's been so anxious for this. And the other night we both visibly saw my belly move due to a kick -- that was wild! The baby is getting bigger and bigger (1 1/2 lbs already), and while s/he is no longer exactly floating in the amniotic fluid, there is still enough room for flips and somersaults. Boy, does that feel strange! Over the next month, the little one's brain will be the main focus of development. I need to really focus on eating "brain food" for him/her! And, around now, my baby is already favoring either his/her left hand, or right hand! While his/her eyes are still closed, loud sounds may cause the baby to blink. I read that Joe might be able to hear the baby's heart beat now using a toilet paper roll & placing it about 4 inches below my belly button. We'll have to try that! My belly has really grown in the last week, and the books say my uterus is now the size of a soccer ball!! I thought I might pass along a few products I've been using that have been great, in case any of you are pregnant, or have pregnant friends. I simply could not live without this piece of clothing. It is an elastic piece of fabric that covers my belly and goes over the top of my pants. It allows me to wear my pre-preg pants un-buttoned, and also allows me to wear maternity clothes that are a bit too big for me. It basically holds everything in place. But it also just feels really good having that support around my belly. I wear a bella band every day! I bought the Snoogle from Amazon.com on the recommendation of my friend Tina and have been so happy with it. It is a body pillow in a C curve. It give me just the support I need to comfortably sleep on my side -- either facing the pillow, or resting my back against it. It is very comforting. The only thing that I don't like about it is that I have to climb over it a couple times a night to go to the bathroom. At first Joe and I had it between us, but that wasn't any fun either. Now I just climb the Snoogle mountain. It is worth it, though. I rub this on my belly twice a day and really like it. I started out using Burt's Bees Belly Butter, but I like the oil much better. It soaks in really fast and smells really good. I have a few stretch marks on my belly, but hopefully this oil will help me avoid too many more as I keep on s t r e t c h i n g !